Don=t relegate sweet potatoes to only Thanksgiving and Christmas menus! They should be enjoyed all year round and in ways that don=t bear any resemblance to how we typically see them used during the holiday season. 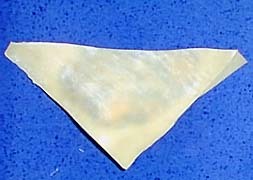 Using store-bought wonton skins eliminates nearly all of the prep work Stuffing the wonton skins is the most time consuming part of this recipe, but enlisting help from family and friends can make this chore a delightful part of your Sunday Supper experience. We experimented with the Kotobuki and Jewel sweet potato varieties to compare which one yielded better flavor. (For more information about different sweet potato varieties, visit http://www.saturdaymarket.com/nakashima.htm.) The Kotobuki yielded a drier stuffing compared to the Jewel, but both tasted great! A small amount of lemon juice added to the sweet potato stuffing is the secret ingredient that brings out the sweet potato=s hidden soul. Try using lemon juice in other sweet potato recipes! Place 2 medium-sized sweet potatoes on a baking tray lined with aluminum foil (to catch the sweet syrup that flows from the potato during baking). Bake for about 40 minutes, until the sweet potato is cooked, but not mushy. Remove them from the oven and let cool. Peel and mash lightly. One potato should yield about 1 1/2 cups (about 35-40 wontons). 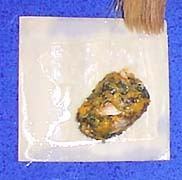 mixture on each wonton skin. of each skin with water. and seal the edges firmly. The wontons can be deep fried (about 3-4 minutes) until golden brown or they can boiled (4 minutes). 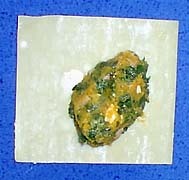 For boiled wontons, a browned butter, which is seasoned with thin slivers of fresh sage leaves, makes this a savory dish. For a simple Sunday Supper, serve a bowl of wontons accompanied by a green salad.